Maple Syrup and Springtime in Canada are synonymous for many of us. My mother, an adventurous foodie before foodie was even a word, used to actually tap the maple trees outside our home in Northern Ontario. Then the kitchen would be filled with maple perfumed steam for hours on end. The result was always very small in quantity but big in flavour. We would savour it, the more because it was so labour intensive to produce, poured on pancakes with sausages and bacon. That maple fog that filled the house remains one of my favourite childhood sensory memories. It isn’t necessary to go through the hard work of maple syrup making to enjoy the sweet rewards, however. Spring in Burlington offers several opportunities to enjoy the pleasures of maple syrup without all the work. 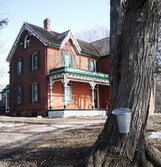 At Bronte Creek Provincial Park, Fresh Ontario Maple Syrup will be yours to savour every weekend in March. At Bronte Creek, the costumed interpreters will demonstrate how to tap the trees, and how to make maple syrup and maple sugar. During the Maple Syrup Festival, a wagon will take visitors to a heated pancake shack for fresh pancakes, sausages and, of course, maple syrup. It’s a great opportunity to enjoy the outdoors while learning a little history, and to taste a bit of our most delicious heritage. The maple syrup festivities are open to the public from 9:30 a.m. to 3:00 p.m. every weekend in March. For more information call 905-827-6911 or visit their website. Maple Towne at Mountsberg presents a delicious celebration of our national spring obsession, with a traditional sugar shack, steaming kettles of boiling sap, and tasty treats to sample. You can savour pancakes, with maple syrup, naturally, in an outdoor pavilion. Visitors learn about the process and history of maple syrup and gain an insight into the life of our ancestors through displays and demonstrations, and can also experience an authentic horse drawn wagon ride through the sugar bush. In addition to the maple syrup activities, there are visits to the play barn and demonstrations of amazing birds of prey at the nearby Raptor Centre. 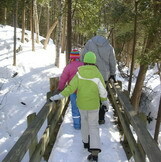 Or take a leisurely hike along the Wildlife Walkway where you may come face to face with an owl or hawk. At Crawford Lake, you’ll see how native peoples produced ‘sweet water’ or maple syrup. On guided hikes, you’ll learn how maple trees were tapped and you’ll get to sample delicious cornbread dipped in fresh maple syrup. Afterwards you can tour the restored 15th century Iroquois village and its longhouses, then make crafts, watch a video presentation or enjoy walks along the boardwalk that circles Crawford Lake or along the many hiking trails. Maple Towne at Mountsberg and the Sweet Water Season at Crawford Lake take place weekends to April 9, 2012 on weekends and holidays. When you visit Mountsberg or Crawford Lake or Bronte Creek for the Maple Syrup Festivals, you will be participating in an activity that has been central to culinary life since, some say, before recorded history. Native peoples knew the qualities of maple sap, even if they did not have the iron pots for concentrating the sap into syrup. They would use it as a sweet drink or a hot tea. Early settlers, with their wooden buckets and iron pots, developed techniques for concentrating the sap. After that, maple syrup and maple sugar became staples that could be found on every table during the 17th and 18th centuries when other sugars were in short supply. And the sugar shack became an important gathering place in springtime. Here, great clouds of maple steam made the shack toasty warm, and if you were lucky you could try out the syrup, or enjoy the ‘taffy’ formed when the hot thick syrup was poured on snow. Everything’s better with a Little Maple Syrup! · Pour it, of course, on pancakes, french toast and waffles but don’t forget to put a bit on the bacon during the last few minutes of cooking. It gives a sweet glaze to the bacon that is irresistible. · Add maple syrup to softened butter, mix and chill. Serve the maple butter on sweet rolls or raisin bread. · Sweeten your apple sauce with maple syrup instead of white sugar. · Use it to sweeten your tea or coffee. · Add it to baked beans. · Glaze squash, sweet potatoes or carrots with some maple syrup. · Pour over ice cream for an easy and delicious dessert. · Serve it with corn fritters. · Sprinkle maple sugar on top of your grapefruit. · Drizzle maple syrup or maple sugar on top of hot oatmeal. Be creative! Maple syrup partners well with many dishes. And it’s good for you. While it has the same number of calories as white sugar or other sweeteners, maple syrup contains iron, calcium and thiamin. In a recent exposé posted by a sneaky reporter who posed as a footman and gained access to Buckingham Palace, it was revealed that, on the breakfast table shared by the Queen and Prince Philip, was a silver jug full of Canadian maple syrup. In fact, the top maple syrup producers have been sending cases of maple syrup to Buckingham Palace for decades, to please the royal sweet tooth. And a truffle maker in Fredericton last year shipped his popular maple flavoured truffles, in a specially designed maple box, to the Queen. Rumour has it that Canadian maple syrup will be on the menu for the wedding breakfast for Kate and William that Queen Elizabeth will be hosting for the couple and their closest friends. · It takes 30-50 gallons of sap to make one gallon of maple syrup . · Maple syrup can be concentrated further to produce maple cream, maple sugar, and maple candy. · Usually a maple tree is at least 30 years old and 12 inches in diameter before it is tapped. · As the tree increases in diameter, more taps can be added to a maximum of four taps. · Tapping does no permanent damage and only 10 percent of the sap is collected each year. · Many maple trees have been tapped for 150 or more years. · Each tap will yield an average of 10 gallons of sap per season, producing about one quart of syrup. · The maple season may last eight to 10 weeks, but sap flow is heaviest for about 10-20 days in the early spring.